By having a regular time for Family Worship, you will provide your children with memories to last a lifetime and a strong sense of devotion to their Creator. We try hard to have family worship in our home before bedtime. It is usually the last thing before everyone goes to their rooms for the night. There are many ways to make your family’s worship a special time that everyone can look forward to participating in. First, I would suggest you seek the Lord out and ask Him to direct your worship. After all, He is the One we are worshiping! We want it to be pleasing to Him, right? Secondly, choose the best time of day. If you are able to have morning and evening worship – wonderful! I try, but there are days when it just doesn’t work. In our house, we have morning worship at the table after eating breakfast. This works out easiest for us. Evening worship in our house usually happens around 7 pm. If you are not able to do it twice a day, choose a time when the family is generally together – right before bed, before leaving for school, etc. Family Worship does not have to take very long 15 minutes is usually all you need to have a good experience. Of course, if you are enjoying yourselves and time is on your side, why not take as long as you like? You will want to choose a good devotional book or a book with Bible stories suitable for the ages of your children. You may also want to purchase song books with fun worship songs. In our house we use a book that my husband used in church as a child back in the 1950’s. It is called Happy Songs for Girls and Boys. I was very lucky to find a big stack of these song books for free at a church school book giveaway. We also have a number of praise song books and of course a good number of fun songs right in our heads! If you have a family member – including a child – who plays the piano or guitar or other instrument,encourage them to play for worship. I am especially partial to guitar music at worship time!! In our house we like to start by singing songs, followed by story time, discussion, Scripture memory, and prayer. Give your children an opportunity to share prayer requests and then make a point to pray for them. You may want to keep a family prayer journal and record prayer request in black ink and answers to prayer in red ink! Worshiping God together as a family will bring you closer together as a family and closer to God! Each family will have different ways for worshiping. In our family, our son looks forward to “directing” the worship. He generally plans a bible verse or chapter to read and will choose three songs out of our song book. He will choose the story which I then read. Yesterday, he read the first several chapters of Genesis and then recited them with striking accuracy for us and then asked us his own made up questions. We try to encourage him and make him feel special when he puts forth such an effort. All children enjoy feeling that they have an important role in the family. By assigning tasks for worship time, they can feel they have attributed something worthwhile to the eperience. When parents show their children they are committed to worshiping God on a daily basis, children will grow up knowing and looking forward to the time each day that should be set aside for praising our Lord and Saviour. I think sometimes we underestimate children’s ability to understand the deep things of God. Children are like sponges and they are naturally curious about heaven, God, the Bible, and anything you are willing to share with them. Children can be incredibly wise if given the chance! Bless them with your knowledge, study the Bible alongside them, demonstrate a willingness to know the heart of God. Hopefully our children and yours will grow up and continue this devotion each day whether it be with their own families or privately. Make worship fun while at the same time teaching the children how to be reverent. You have probably seen those blue hardback Bible Story books in the doctor’s office, dentist office, or hospital. I remember my mother reading stories from them while we sat for what seemed like hours in the waiting room at the doctors office when I was a little girl. We didn’t own a set of our own back then. Well, now I have a set of my own. In fact, in our house, we have several sets and even recently purchased a set for each of our children. We found used sets on ebay. I highly recommend you purchase a set for your own home, if you have not already! The books authored by Arthur Maxwell, are written in a classic story like fashion. The illustrations are charming. But the most important thing about these books, would have to be that they teach you the Bible! They are perfect for children and parents alike! If you are a mom, like me, who didn’t grow up with a solid knowledge of the Bible and the stories, this 10 volume set is perfect! You will learn so much from just reading the stories. You should visit their website, and learn more. And if you can’t afford the price of new books, get some used ones! You can find them on eBay and they are usually in excellent condition! These books will be a welcome addition to your Family Worship time. I know I have mentioned this before, but in our house, I try to have family worship each morning just after breakfast before we clear the table. This worship time tends to be shorter than our evening worship. You also know by now, that I am a firm believer in morning devotions for women. It is so important to seek out Christ first thing in the morning before we do anything else! So, if it is so very important for each one of us to have personal devotions every morning, isn’t is just as important for us to teach our children to seek out Christ first thing every day? Are you walking with Jesus each day or do you feel like He is often going one way and you another? Has Jesus walked on past where you were going? Or have you constrained him? Morning devotions give us the opportunity to wrap our arms around Jesus and constrain him. Morning worship helps us grasp His hand and tell Him, “Abide with us!” Through morning worship we are able to seek out Christ daily and keep our focus on Him. 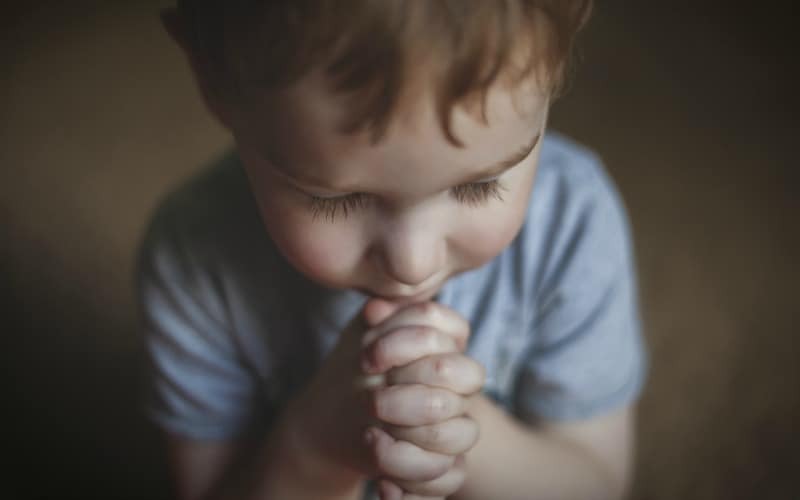 Our children need to be taught how to “abide with Him.” Create in your children – now – a desire to spend time with Jesus at the beginning of the day so that when they are grown it won’t be so hard to get into the habit. As a family find His purpose for your lives. Discover together what it is you can do as a family to serve Him on a daily basis. Use morning worship time to discuss the days events, plan how best to use your time and most importantly pray that God’s will for the day will be made known to each one. Teaching our children to worship God with respect and reverence and with adoring love is not something to take lightly. So have you prayed about it? 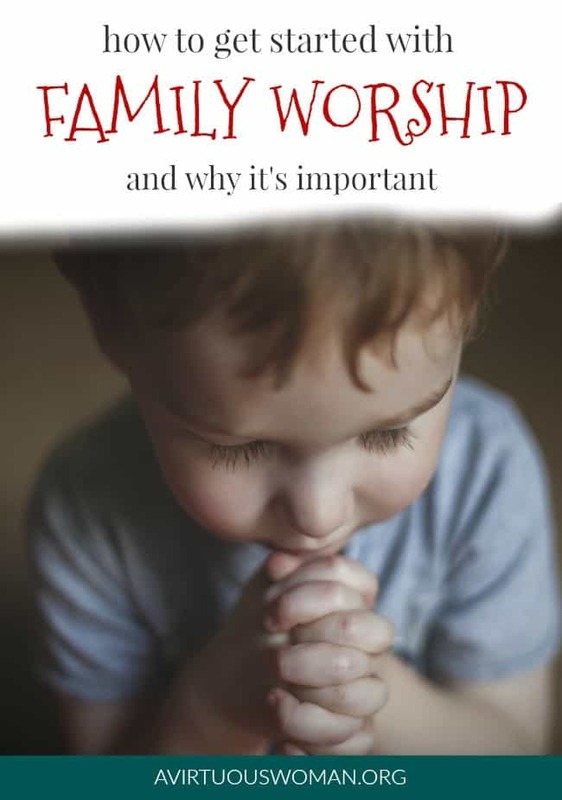 What is it that God wants you to teach your children through family worship? What is it God wants you to learn through family worship? How can family worship bring you closer as a family? Prayer should be our first priority no matter what it is we are undertaking. During worship our hearts should be open to the Holy Spirit’s leading. Sometimes trying to keep little ones still and interested can seem like an uphill battle. If you are having a hard time with your little ones (or even the older children) bring it to God! Ask Him to bless your worship experience and to show you exactly what you should be praying for and what your worship time should focus on. Family worship is a perfect time to work on Scripture Memory as a family. I remember the very first verse I ever committed to memory. It was Romans 6:23 and I was just 9 years old. It has stuck with me all these years. Teaching our children to commit God’s Word to their hearts is something powerful that will stay with them all the days of their lives. Perhaps as a mom, you have never really committed very many Scripture verses to memory. That’s okay! It is never to late to start. When we have God’s Word hidden in our hearts, in a time of need we can pull up those words and they will comfort us and remind us of God’s faithfulness. Here in America we are very blessed to have the right to worship God however and whenever we choose. We can purchase a Bible or even obtain one for free if we need. What would happen if there came a time when you could not access God’s Word? Would you remember what He said? Would your children? As your read your Bible and come across verses that really speak to you, write them down in your family worship journal so that you can come back to them, one by one! Children are like sponges and they soak up God’s Word so much easier that we adults do! Use this precious time to instill the goodness of His Word in their hearts. We have been reading a book each morning for worship called Angels on Horseback and Other “Grandma Stories.” I found the book at a church school library giveaway last year. It is not a fancy book. In fact, the printing is very basic and the binding looks homemade – but the stories are wonderful! They are full of our church history. I didn’t grow up learning about church history. I want my children to know about those people who changed the course of the world through their faithfulness to God! Stories of great leaders – stories of their real lives – show our children that despite the odds and despite the struggles we can all lay down our lives for Him. These kind of stories show our children where they came from, the legacy of faith and the spirit of truth that has lived in men and women down through the ages. That’s what family worship is for – to inspire our children (and ourselves) to live for Jesus everyday – at home and away. As mothers we have been commissioned first to be ministers to our families, our husbands and children. We are to care for them in a way that Jesus would care for them. We are to show them that true faith is demonstrated in a life of service to those around you. Family worship strengthens our relationship with each other and gives us courage to face the day with determination to live a consecrated life, to live a holy life. It brings into focus why we worship our Savior and show us the purpose He has for each one of us. As moms, we have an incredible responsibility to raise our children to worship our Lord. There comes a time in every child’s life when they must take hold of their parents faith and make it their own. They have to believe for themselves. How do we as parents, insure that our children do not walk away from the faith we have taught them when they are grown? An astounding percentage of children (over 80%) leave the church when they grow up and leave home. This is across every denomination! It isn’t enough to simply take your kids to church every now and then or even every week. You need to show them how to love their Creator, how to worship their Father, how to have a special, close relationship with Jesus Christ. You need to give them an example to follow as you daily die to yourself and walk a consecrated life for Him.“Train up a child in the way he should go and when he is old, he will not depart from it.” Proverbs 22:6. Ye shall diligently keep the commandments of the LORD your God, and his testimonies, and his statutes, which he hath commanded thee. And thou shalt do that which is right and good in the sight of the LORD: that it may be well with thee, and that thou mayest go in and possess the good land which the LORD sware unto thy fathers… And it shall be our righteousness, if we observe to do all these commandments before the LORD our God, as he hath commanded us. We are to teach our children to worship God and keep His commandments when we wake up and when we sit around the table and as we go through our day. Point out to your children the wonders of God, answers to prayer, miracles that happen. Pray together as a family and pray for your children – in private and with them present. And worship God together as a family. Family worship not only strengthens their faith. Family worship strengthens your family. Having daily worship gives you an opportunity to show the children how to delight in Jesus. Pray and ask God to bless your family worship time. Ask Him to help your children learn reverence and to look forward to the time you share together. Choose a time in the morning or in the evening for worshiping as a family each day. If a daily worship time feels overwhelming, choose one day of the week and a specific time – such as Friday evening at sundown. Choose a devotional book, an edifying story book, and/or a passage of Scripture to read out loud. Choose a few songs to sing that your whole family will enjoy. Work on memorizing a verse or passage together as a family. Ask for prayer requests and close your family worship with prayer. Kneeling as a family or holding hands is very special. I agree wholeheartedly, Melissa. Family worship was harder when the kids were little, but God blessed our efforts. We had morning and evening worship, singing and prayer together. It was probably a bit rowdier than we would have liked, but the kids learnt to sit still and calm down. Now, as 8 and 10 year olds, they love worship. We turn our memory verses into songs and sing them together. We find it makes memorisation a lot easier. (We share them at the Musical Memory Verses channel on YouTube. ) Although I definitely had shorter personal worship time when the kids were little, I would make up for it by listening to EW and the Bible on my mobile throughout the day. Bible.Is is an amazing app that our kids loved (and still love today). We used to pop it on while they played Lego, blocks and dolls. It's quite impressive how much our girls remember about the Bible from their listening time. Thanks again, Melissa.